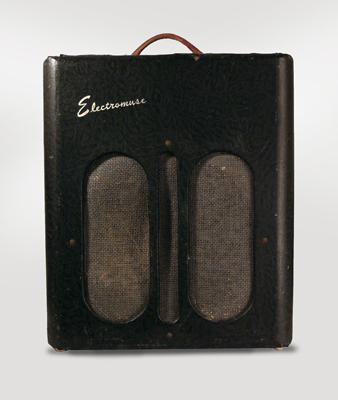 Electromuse Tube Amplifier (1940's), made in Chicago, black vinyl covering finish. Height is 18 1/2 in. (47 cm. ), 15 1/2 in. (39.4 cm.) width, and 9 in. (22.9 cm.) deep. This 1940s Chicago-made amp is fairly well worn overall, missing the back panels but mostly original internally. The leather handle is a more recent (and pretty industrial looking) feature. Recently serviced, with a new 3-prong cord. A cool, funky amp with a fairly gnarly sound when cranked. Very Good Condition.